FABIO BORINI insists he is well aware that the summer transfer saga involving the chase for his signature will have left Sunderland fans “frustrated”. Sunderland made Borini their number one target at the end of last season after the Italian’s successful loan spell at the Stadium of Light. But despite Sunderland agreeing a £14million fee with Liverpool, Borini essentially priced himself out of re-joining the Black Cats with his wage demands. As the Echo reported earlier this week, Sunderland have no intention of reviving their interest in the upcoming January transfer window. And prior to Sunderland’s clash at Anfield today, Borini told the Liverpool programme: “I realise what happened in the summer probably frustrated a few people when I didn’t move to Sunderland permanently. “But my time there put a good stone in the ground in terms of the Premier League for me and I will always remember Sunderland. 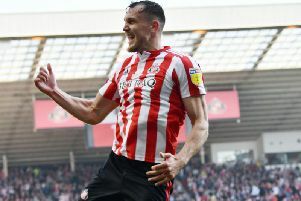 “I said in an interview I did towards the end of last season that Sunderland took a piece of my heart and I will always have a lot of time for the club and the supporters. “Having said that I am a Liverpool player so if I’m involved and I score, I will celebrate. “Since I returned to Liverpool I have played Champions League football.